The other day, a man walked by me and my husband on a street in Casablanca and called out “Cote d’Ivoire!” I think he found it clever because ivory is white and the Ivory Coast is a country of dark-skinned people. Unfortunately I didn’t think of my comeback quite fast enough, because the man was already out of hearing range when I called back at him, “la mongolie!” I too can play the calling-out-random-countries-at-strangers game. This got me thinking, what would happen if things that are common on the streets of Morocco were to happen in the U.S.? If this exact episode happened in America, I’m pretty sure that any onlookers would think that the man must have a mental illness; why else would he call out something either completely random, or potentially very offensive? Similarly, people (men) often tell me that I am welcome in Morocco, even after more than three years of living here. What if a white American told an Asian-American that he/she were welcome in the United States? I don’t think that comment would go over well. What people wear on the streets in Morocco is not the same as what they wear at work or indoors. Today I wore a knee-length skirt to work, and plenty of men along my walk had something to say about it. That same skirt would be considered pretty modest in the U.S., and probably would not turn any heads. Occasionally young boys call Africans the word “azzi,” a shortened version of the Arabic word for black. Sometimes they say “abid,” meaning slave. If that came to the U.S., the Black Lives Matter movement would have plenty to say about it. Morocco is not the U.S., so those things will probably keep happening for years to come. Maybe when I get to Boston I’ll bring yelling things at random people on the street into fashion. Or not…. A fun thing about being an ESL teacher is that you get to learn a lot of little details and facts from other people. I get the opportunity to talk about politics, religion, culture, and also just daily routines and opinions about life in Morocco with my more advanced students. Here are some completely random but interesting facts I’ve picked up. One reason why eating pork is forbidden in Islam and Judaism may be that pig meat spoils easily in the heat, since both religions have origins in hot climates. But what if you eat chocolate with coffee? There is no wage gap between men and women in Morocco – but that’s not to say that there aren’t more men in leadership positions. Morocco was the first country to recognize the United States as a country, just after independence. Earlier this week, my husband told me that he was calculating the outcome of his time in Morocco. He said he had spent money on his studies and on living here, probably more than he had earned in three years of working. But, he said, he still thought he had received far more than he had given. He learned how to do his career, even if the studies and unpaid internships were expensive. He learned how to live on his own and how to support himself. He gained a community and served the same church for ten years. He became a better singer. He met his (lovely) wife and began married life. Overall, he gained more than he lost. I’ve also learned a lot since first coming here four years ago. How to find an apartment and pay my taxes, how to keep myself healthy, how to teach and how to lead a group, how to speak other languages, and how to work on a team. I gained the experience necessary to choose and apply for a masters, I saved some money, and I made new friends. I got baptized and I got married to my (amazing) husband. But the biggest thing I think I have learned is pretty simple. The most important thing I’ve taken away is that nowhere and nobody is really so different from what I know. Even here in Casablanca, I can make friends, find people with similar interests, and enjoy when my neighbor blasts my favorite Taylor Swift song (Love Story). Of course, not everyone has the same opinions, traditions, or beliefs, but I know now that I could live in many different places in the world and feel at home. I know that I can become friends with someone from any culture or from any religion or any upbringing. But along with that, I also feel more empathy for those in need in many situations. Before, when I read news stories about the Middle East, war-torn countries, or plane crashes, I brushed them off as things that could never happen to me. But now I can imagine myself or someone I know being in a city that was attacked or being on a plane that was lost. Those places, and the people in them, now seem closer to home. I hope I will soon become a social worker who works with refugees, and I hope this will help me do a better job. But I guess I’ll have more to say on that later! For some reason, this has not at all been exploited as a tourist destination, though it’s my favorite place to visit. To get to the top of the lighthouse, you have to climb up the winding staircase, guided by a man who lives next door (he does ask for money, but it’s negotiable.) At the top, you can look out over the entire city, and across the vast ocean. You also get an up-close look at the light at the top, which I found interesting. What could be better than a beautiful view AND a workout? This is a restaurant/bar that is on the 28th floor of the Twin Center. It offers a beautiful view from the other side of the city from the lighthouse. You can take the elevator up (no workout for this one) and have drinks while you watch the sunset. The best views can be found in the handicap bathroom, so make sure you take your camera when you have to use the toilet. This is a market where goods are sold in bulk. They sell to restaurants and shops, but you can also walk around and buy from the market. It’s in a particularly car-filled and polluted area, but once you go into the covered market areas, it is a sea of treasures. I like to shop for little household items and beauty products. Once, I found a french-fry cutting machine, and now I can slice perfect fries in just a few minutes. My favorite part of the market is the dried fruit and nut section. I always stock up on peanuts, crystallized ginger, dried pineapple, and dates. And the best part is that you can sample each on before you buy them! This is the city’s main shopping neighborhood, and is primarily known for wide avenues lined with upscale stores like Zara, Mango, and Massimo Dutti. But if you venture into the residential neighborhood, you’ll find a plethora of smaller hole-in-the-wall stores selling last season’s fashions (mixed in with some imitations). And if you’re not into clothes, you might want to stop by one of many vegetable stands, bakeries, bookstores, or underwear shops. I walk through the busiest area of Maarif on my way home from work, which is perfect for picking up fresh groceries on the way. And yes, I have made a purchase from the Underwear Man. Casablanca’s corniche is one of the best known tourist destinations, along with the mosque Hassan II and Morocco Mall. I think it’s worth mentioning anyway because it is such a nice part of the city. The path stretches more that 4km, and is perfect for running or walking. Casablanca certainly is not lacking in bakeries. There are some nice ones with outdoor seating where you can enjoy your pain au chocolat in the sun, though the coffee and tea is always very expensive in these cafés. My favorite thing to do is to buy a pastry at one of the four shops just on my street, and then bring it home to warm up in the oven and enjoy with a cup of coffee on the balcony. In other words, the very best spot in Casablanca might just be my balcony. Imagine that there is a chocolate fondant on the table. What could be better?! When I first came to Morocco nearly four years ago, it was love at first sight. The weather was perfect, the people were friendly, the food was delicious, and every day was an adventure. There are not many job options outside teaching, which is not my career. I have also worked part-time in two NGOs, but both were pretty shockingly disorganized. I don’t think I ever attended a meeting that didn’t start at least an hour late. Getting a visa is a yearly challenge, especially for Africans. My first year, my employer did everything for me, so I never even knew how difficult it was. These past two years, I’ve had quite a bit of trouble renewing my visa due to unhelpfulness both from my new employer and from the staff at the prefecture. And my husband has been working for almost three years on a student visa because his employer doesn’t want to pay the fees for a foreigner’s contract. It’s just really hard to walk down the street. I’m lucky enough to be able to walk to work, but feel so much less lucky when men comment on my clothes or appearance, or especially when they try to follow me. It’s better when I walk with my husband, except on the occasions when people (men) yell racial slurs at us. And then there are the broken sidewalks…. The rising culture of materialism is exhausting. Like any fast-developing country, Morocco has become more and more focused on material wealth. The thing to do on the weekends is to go shopping, and having a car has become a status symbol. I struggle to explain to my students that I don’t have a car because I like to walk, not because I can’t afford one, that I don’t eat at the most expensive restaurants because I actually like to cook, and that I want to become a social worker because I genuinely find that profession fascinating, not because I got rejected from programs in technology or finance. My idea of a good career is one that I find rewarding, not necessarily one that pays a lot of money. This guy probably gets his hair done in a salon every week. There are things I love about Morocco too; the community I’ve found here, the opportunities I’ve had to meet new people and learn new languages, and the chance to experience another way of life. The ocean in Casablanca is beautiful, the vegetables are always fresh, and my husband and I have wonderful friends. But there’s a time for everything, and I really feel like it’s time to find a place to live with more trees than cars, even if it is somewhere with cold winters and no pomegranates. 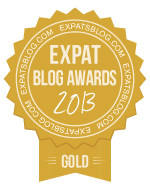 Check out my interview on Expat Blog!